Some Mac users have discovered that Mail app has stopped showing attachments after updating to Mac OS Sierra, despite not having manually removed the attachments themselves. Additionally, existing emails with attachments may appear as if the email attachments disappeared entirely. While having disappearing Mail attachments can be alarming, you can usually resolve this issue with a two-step process. While this is aimed at resolving disappeared attachments on MacOS Sierra Mail app, it will likely work with other versions of Mac OS that have disappearing or vanished email attachments as well. This two step process should work to reveal any missing email attachments in Mac Mail app again. If you are not sure of what you are doing, you should backup your Mac before beginning this process. Rebuilding an email inbox should not be problematic, but it’s better to be safe with a fresh backup anyway. Attachments should be visible as usual again, unless you either have them disabled or they are an incompatible file format. Typically if you are getting incompatible attachments, they are from a windows sender and this tip for opening Winmail.dat files on a Mac can be helpful. It’s also worth noting that very large attachments in Mail are sent through Mail Drop nowadays often, assuming they are sent from another Apple user with iCloud, and thus the attachment will be a download link instead of a true attachment. Separately, you should also update to the latest version of Mac OS Sierra that is available, as of writing that is 10.12.2. Backup the Mac and then go to the App Store Updates section to find whatever MacOS update is available for the computer. If you are specifically avoiding MacOS Sierra due to problems or for some other reason, obviously you wouldn’t want to install anything beyond incremental software updates or security fixes for your specific version of Mac OS or Mac OS X instead. Did this work to reveal missing email attachments on your Mac? Do you have another trick or troubleshooting step that resolved the issue for you? Let us know in the comments. I’ve had this problem ever since I upgraded to Sierra. I have 50,000 emails many with large attachments that I have to keep on our mail server, so rebuilding the mailbox took a few days, but unfortunately it didn’t solve the problem. If I go to the Exchange website and view my email in there, every attachment is on there, as it also is when accessing the mail app on iOS, so it appears to be just a Sierra issue. This is not a Sierra problem. My problem,and many others’ problem, is that the reply arrows and forwarding arrow stopped showing after August 2016. I did not have Sierra at that time. This is a mac mail issue. Apple can’t fix it, the “experts” online can’t fix it. The last forum had no solution. I have those arrows with my icloud and hotmail email accounts, but not mac mail. 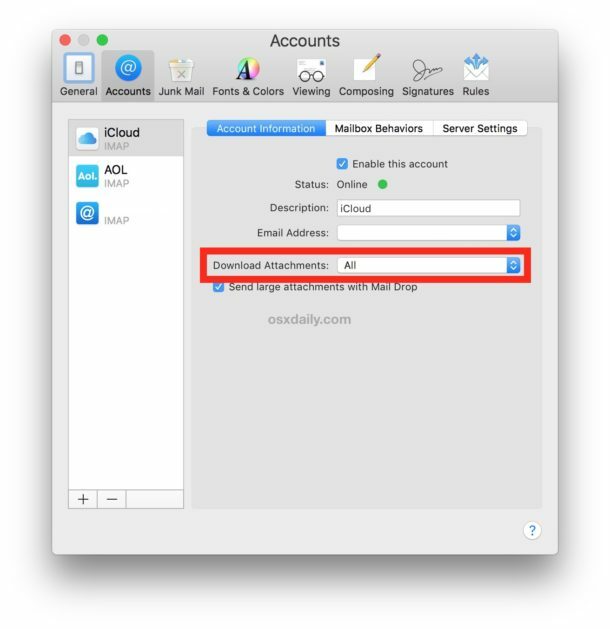 What about regular non Icloud IMAP accounts ? Only way I could do it is was set my IMAP back to POP. Come on, Sierra needs to address this. I had this problem. It was fixed with Sierra 10.12.2 update. Upgrading to Sierra 10.12.2 did not fix my problem. Mail attachment icons still missing. I can see attachments icon, but not forwarding or replying icons in mac mail. It’s not a Sierra problem; it’s a mac mail problem. I have those icons with hotmail and icloud. Well I’ve updated to 10.12.2 and I still have this problem. I will try this solution in the morning as my mac is two floors away and it’s the middle of tge night- this issue has been driving me nuts. Worst problem since Apple broke local sync in iTunes for ios a few years ago. When sending an email with an attachment, it appears in my Sent-box, with the attachment. Now, when I move this message to another mailbox “on my Mac”, the attachment disappears permanently and cannot be retrieved. But: when I move a received email with an attachment from “Inbox” to another mailbox “on my Mac”, the attachment remains visible. I have been on the phone with Apple Support; it was presented to a senior, who stated that this complaint has been heard before and he suspected it would be resolved in an update. Unfortunately, this appears not to be the update 10.12.2; the problem persists. I’m having the same problem. By organizing mail regarding different projects into folders, I’ve now lost all the sent attachments. I tried moving them back to the “sent” folder and they are still gone. I just upgraded to Sierra last week and other than having to re-download filters for Adobe Photoshop CC (which is always an issue every time there’s an OS change), I thought all was fine until this happened. It’s such a huge issue with their own software. You’d think Apple would be on top of this. I have tens of thousands of emails and can’t wait days for my email to rebuild. Hope they fix it soon. Don’t they test these things? It’s their own software, it should be a no-brainer! I too have the problem with sent email attachments disappearing if the mail is moved to another folder for archiving. We have a number of machines which we updated to Sierra and all exhibited the same problem immediately after the change. Luckily a few machines weren’t “updated” from Yosemite and these are used to move our sent emails. What a pain for the last few months. Also noticed if you move a received email from one folder to another, then onto a third fairly quickly most often the attachment will disappear. I had a friend with the same problem. Fixed it by downloading Sierra again from the recovery menu which keeps your files & what not. But do backup !! Mail app is the absolute worst email client: I have no qualms with the UI, but basic functionality such as filtering, rules, “smart mailboxes”, etc. are all poorly implemented and buggy. The fact that this new issue manifested itself with OS X Sierra (sic) only leads me to conclude that Apple does not fully test or quality check in their development cycles. As for my grudge with Mail, I have reviewed other email clients: Outlook for mac is nowhere near as robust as it should be and does not integrate with OS X contacts; Thunderbird is very barebones, and in some ways, as poorly implemented as Mail; Airmail looks promising, but is no trial version for testing. I’m at a loss — genuine suggestions are welcome. I totally agree. this is symptomatic of very poor quality control and lack of thorough testing. I also suspect “accretive” coding, which is where software engineers try to solve problems by adding patch code until the code becomes a mess of spaghetti. Only solution may be to fire the whole department (after writing glowing recommendations so they will be hired at Microsoft) and starting over. I also agree that there ain’t much better out there. sad. @CGL: thanks! will give it a try! I have a problem with encrypted mails: attachments in encrypted mails i received are shown but with 0 kb file size. I can not open or download them. Accessing the mails with Outlook shows that everything is o.k., the attachments are there with the correct size and I can open and download them. I’ve the same Problem here and the update with rebuild takes no result. This solution worked as stated. The attachments were PDF and Word compatible documents and they seemingly disappeared. I thought “I” was going crazy…my boss thought I’d lost it…Thank you!!! 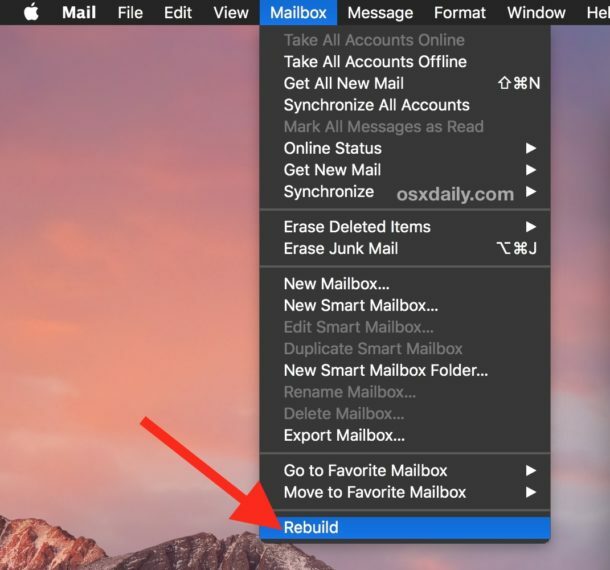 It worked to me by upgrading to Sierra 10.12.2 and then rebuilding the mailbox. Thank you! I am trying to send a 530 kb attachment but when I hit send I get a message telling me that the attachment is still loading, but never does. Under the attachment in small, blue type is the number 515 kb. This is, of course, is a tiny bit of information, so it should go through in a blink. Again I have a slightly different problem. I can see the attachment if I forward it to myself, but not on the original email. This seems to happen with airline bookings! OK, so the new OSX Mail software can’t seem to get it right, despite the obvious fact that we’ve had OSX mail in roughly the same format since the early 2000’s (15 years). Apparently the group of people at Apple are coding small, arguably unnecessary, changes that are corrupting the good code. A common theme these days. 1. Do you trust using REBUILD command written by these guys? 2. Why do we so willingly upgrade software? There is no evidence that new code is better than old code. It’s like the boy who cried wolf. Thanks! Did the job for me! I also had the problem about disappearing attachments from the Mail app (thought I was going mad, but could clearly see the attachments when accessing my e-mails through webmail). Upgraded to Sierra 10.12.3 this morning and I can see my attachments again – for now! – without needing to rebuild. I just updated to Sierra 10.12.4 and still couldn’t see attachments or the sender detail/subject at the top of the emails with attachments. I did a backup then rebuilt mail and I’m very relieved the missing attachments and header lines are all back and showing as normal. Same issue here – I have the newest version of Sierra and basically a brand new computer. All of a sudden I cannot see any excel attachments in the emails. Tried the rebuild to no avail. I have the same issue with the attachment symbol not showing up after the procedure method in this article. I forwarded an old email with an attachment to myself and all of the sudden the attachment symbols appeared. I have the same problem. I upgraded from Lion to Sierra 10.12.4 and have everything else working and just noticed I can’t see the attachments in Mail. Forwarding the emails to myself won’t work as I need to reply to some of them. I clicked on the Rebuild as instructed above but don’t see anything happening. I hope it doesn’t wipe out files in my inbox that have been there since 2012 (too busy to file or print them). The first time I upgraded from Lion I lost all my mail when I was told to rebuild so reluctant to try it again (I needed to upgrade my hosting mail service first) then upgrade a second time. I also don’t want to upload Sierra again in case of any more problems like reinstalling other software, registering, fixing preferred fonts, colors, preferences, etc. I hope there is another solution. Strange! I rebuilt again (which didn’t seem to do anything), closed then opened Mail again, and it’s working! Woo hoo! Help! I felt deep frustration at not seeing the attachments and found this thread on the web. I tried to shut Mail and reopen but it didn’t show any attachments after March 16. I tried to rebuild, and it wiped out everything in the To and Subject categories from January to yesterday and I almost had a heart attack. Luckily I went to a different mailbox and when I came back, all the emails were there. But no attachments from March 16 on. I had all the same issues, mail not working after a Sierra upgrade. I found that some of my emails were ok, and others were not. There was a setting in Google (Gmail) under Settings/ Sign-In & Security/Allow less secure apps. I turned this feature ON, and all my non working email accounts now work. I hope this helps! Some full disclosure: I still have 1 AOL that is not working, but 1 that is. Thank you, this really helped. I thought I lost all my emails. With Sierra 10.12.6 after October 2017 I send an embedded image, but my message in my sent folder or in my inbox after sending it to myself only holds an icon with jpg or png on it and size text. Double clicking them doesn’t do anything. Sometimes size text changed to “Downloading…” Right clicking I have a copy and speech option. The size text 1.7 MB of 172 KB while real size is the KB one is weird. In the same inbox I have messages with embedded images that I can open with right clicking and double clicking opens preview. I normally zip my attached images, but I lost faith in Apple Mail. Getting the same thing in 10.13.1. This is infuriating. Come on Apple! Yet another example of how Mac email is far lacking on the most basic of functions. Delay delivery? Basic attachments as icons? Heck, even groups? All of these very basic functions still do not function on Apple OS or IOS systems. Apple email is still an amateur program. Same issue here, drives me crazy. Some mails with or without attachements disappeared after I clicked on them and read them once. Nothing remains in the trash or anywhere else. Now I need to forward each new email to another mailbox if I want to keep them. I have just ‘upgraded’ to Sierra and I can’t see my emails at all – the content doesn’t show and neither do the attachments. It is unusable. I have this problem too. I can see a paperclip icon indicating an attachment, but no sign of the attachment in mail. This is with OS X 10.12.6 – still a bug in this version, APPLE – fix it! I forwarded the email to my gmail account, and YES! I could see the attachments in that account. It was the mac.com account that behaved badly with mac mail on a new MacBook pro. Go figure how Apple can’t get mail on its own servers to display properly. BAD! I have tried most things to bring the the paperclp back but to no avail. Then when opening the e mail or sending identify it with the coloured attachments label. Apple mail works just as well as Siri…. So many bugs, I don’t know where to start, and Apple support is a room full of folks jabbing themselves in the eyes with spoons. I don’t have the choice to “Download Attachments” in the Account Information window! What do I do now? Lyn. if you mark it with a coloured flag there is no need to download it as you know that e mail has an attachment and with a double click on the e mail the attachment opens. Thank you so much for clear instructions that worked for me. For a few days I have been unable to open attachments (PDF files) in icloud.com. This has been frustrating. One method I used to gain control is to have the file resent with a different email address. Now I am back in business and can open files okay. Not sure why this happened. Firefox did update their browser yesterday, so would they have meddled with my settings? Using Mac is so nice when there are nice folk out there to help in troubled times. Thank you again. …upgrade to High Sierra and Mac Mail 11.5.. and all the above problems are resolved – worked for me..